Seville’s most picturesque and first-destination-for-tourists neighbourhood, the Barrio Santa Cruz, is equally well known as the old Jewish quarter, but the history and importance of the Jews in Spain (the Sephardim) are underestimated or even unknown to a majority of Western Europeans. It’s not known when Jews first came to Spain (it may have been as long as 3,000 years ago), but it was under the Romans in the early centuries AD that their numbers became substantial, and remained so until the late 15th century, when they were finally expelled by the Catholic Kings. Although they were always second-class citizens, and their relations with the majority populations had many ups and downs, the Spanish Jews generally enjoyed more freedom than Jews elsewhere, and while most were ordinary workers and artisans, a few became wealthy and influential and others were prominent in the intellectual life of society. The interplay of diverse cultures in southern Spain during this time made it the centre of civilisation in Europe, and gave the Sephardic Jews a distinct identity of their own, and for these reasons it is regarded as a “golden age” in their history, and their expulsion is still felt as a great loss and sadness. After the reconquest of Seville by Ferdinand III in 1248, the Jews here (the second largest Jewish community in Spain after Toledo) had their own quarter in the Santa Cruz, surrounded by a wall with several gates, and for about a hundred years they co-existed peacefully with the Christian population. Then, in the general turmoil and paranoia after the Black Death (1348-1350), persecution of the Jews increased, culminating in the pogrom of 1391. After that many Jews fled, or were forced to convert to Christianity. 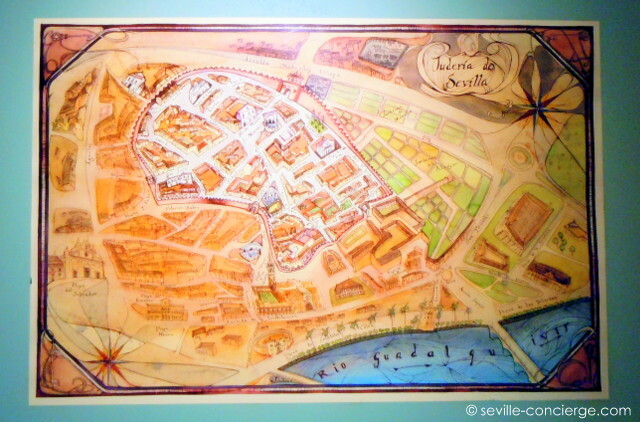 With the establishment of the Inquisition in 1478, and the formal expulsion of the Jews in 1483, the history of the Jews in Seville came to its tragic end. The new Centro de Interpretación de la Judería de Sevilla is Seville’s first museum of the history and achievements of Seville’s Jews, telling their story in words (Spanish with English translations) and pictures and other exhibits.